According to the UN, climate change kills 150,000 people every year. Tony Blair has described the threat as the gravest we face, but does nothing to address the issue. In an attempt to put climate change and energy policy on the public agenda, tuesday saw not one but two actions. 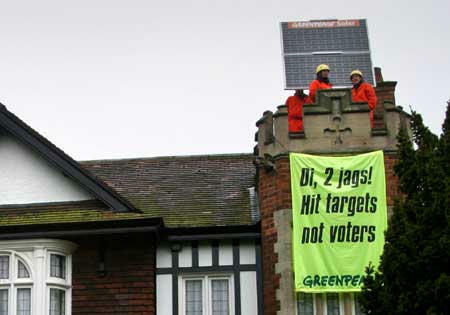 Four women and four men scaled the Deputy Prime Minsiter house in Hull at dawn, erecting solar panels. A banner read, 'Hi, 2 Jags! Hit targets not voters'. Their statement said that John Prescott's is putting Britain's climate change targets at risk by failing to make UK homes more energy efficient. "The Deputy PM's got a reputation for straight-talking, but since the election kicked off we've heard barely a squeak about climate change from big hitters like him... Whoever wins on May 5th needs to get serious about energy efficiency. ", said one of the protesters from the roof. Meanwhile in London, protesters from London Rising Tide climbed two huge trees opposite the head office of British Petroleum in St James Square. They unfurled a huge banner reading 'BP fuels climate chaos' while others leafleted passers-by, BP workers and member of the press. Earlier this month, the BP AGM was targetted by the 'Greenwash Guerrillas'. Tuesdays actions coincided with BP announcing record profits (£1.3m per hour this quarter) as they reap the rewards of surging oil prices since the invasion of Iraq. Some of the protesters stayed up the trees overnight and greeted workers as they arrived in the morning. Note: There will be a day of action against climate change on the 8th July as part of the mobilisations against the G8 summit. Join the G8 Bike Ride - benefit night Sun 1st May (flyer). Fuel Protestors Considering G8 Summit Action? FOE attacks Gov and Tories on Climate Change — what else can we do?